My dear readers, savor these moments that we have together. Savor them. Agent Fawn Tailor is something of a pioneer. Though MinerBumping and the New Order focus primarily on highsec miners, Fawn has taken great strides toward improving the state of the highsec salvaging community. 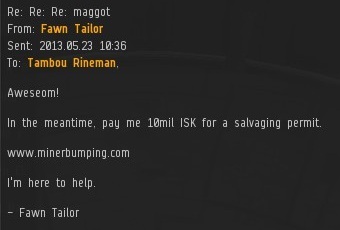 Tambou Rineman lost a quarter of a billion isk when Fawn ganked his Noctis. Tambou took exception to this treatment, but as far as I can see, everything was on the up and up. Tambou threatened to wipe out the New Order. A pop quiz for all aspiring Agents of the New Order: How would you respond to such impudence? If your answer was "with class and dignity", then you just might have what it takes to join the New Order. Join the New Order, see the world, meet fascinating new people. After Fawn Tailor raised Tambou's awareness of the Code, Tambou was shocked to see a bounty notification in his inbox. Zkanu had placed a sum of isk on Tambou's head, reducing him to a highsec criminal from the carebear perspective. Unaware of Zkanu's status as an Agent, Tambou demanded an explanation. Zkanu proudly declared the opening of the New Order Bounty Office. Zkanu's mission: To motivate highsec residents to be their best. Zkanu received a reply from Tom Wherewolf. In a single sentence, Tom admitted to account sharing and AFK salvaging. This more than justified the execution of his Noctis--no wonder Fawn Tailor's "spidey sense" tingled! 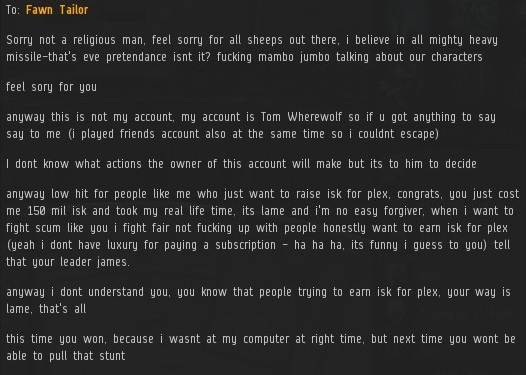 Tom concluded by asking Zkanu to "Leave people to play eve as they want, and harass some other players!" Isn't that a contradiction? Another class act in the New Order, Zkanu took time from his busy day to provide Tom with instructions on how he could assist his friend in complying with the Code. I'm convinced that any one of our Agents could walk up to an embassy and instantly be qualified to serve as an ambassador. Tom's Internet Tough Guy Syndrome was cracking. 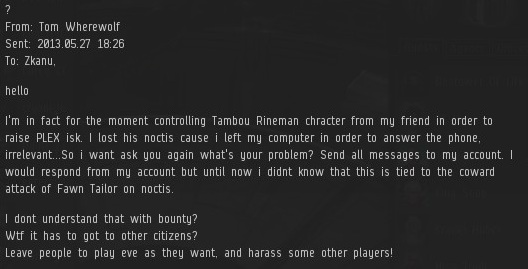 Should he receive another bounty notification, he vowed to get CCP involved. Zkanu considered the threat and responded by modestly increasing the size of Tom's bounty. Thus was born another petition. 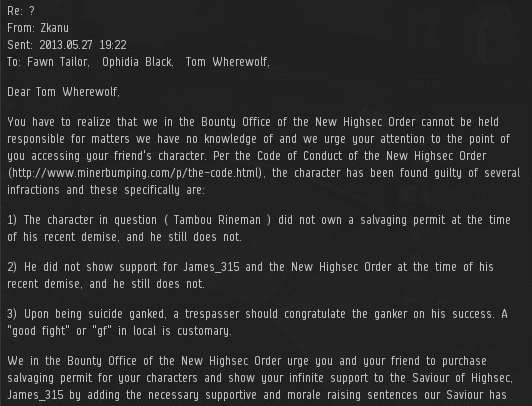 It makes me a little sad, though, to realize that some highsec carebears think bounties are forbidden by the EULA. Think of all the time and effort CCP put into creating the revamped bounty system last year! Definition of hypocrisy: Filing a petition for legal gameplay, while breaking the EULA by using someone else's account. What is the appropriate punishment...ganking the friend's account to show him the error of his ways, or a petition? The EULA violation is something that CCP will take care of, so there is no need for the New Order to do anything but bring it to their attention with a petition. The lack of a salvage permit is an issue the New Order does need to take action over. Meaning gank. Personally, me and the Bounty Office willdo everything within our power to reduce highsec scumbaggery... with our bounties!... and our uplifting words! I'm confused. How does one salvage while AFK? Salvaging a wreck takes seconds. Perhaps the salvager is using a bot or is a bot-aspirant? I hear the new hacking in Odyssey puts loot right into your ship with no salvaging required... a real shame. Regardless, any who do not respect the leader of High Sec needs to pay a hefty price. I'm confused. Why is Estria asking an irrelevant question? Asking a more relevant question takes seconds. The various Bot softwares out there can do salvaging, and can even run some of the simpler missions ... and some of the harder ones if you have a second logi ship warp in and run reps. So yes, bots can salvage. Anon: the new hacking and archaeology systems require some intelligence to run, and are currently bot-proof. Rewards require chasing the loot, and having a second player to help chase will increase rewards, encouraging team play. It is possible that a bot might be designed to hack, but CCP can get a copy of the bot, and make hacking games that can screw it up. Just out of curiosity how much was these bounties? That is a bit low to get upset about. At what level would you deem it reasonable to get upset about having a bounty placed on a fantasy character using make-believe money in a pretend spaceships computer game? At a point where it becomes worthwhile to interfere with my gameplay. Although I get your point that this New Order bounty office is nothing more than a New Order raspberry I would have thought with their 91 billion (minus James315 expenses) they could afford a reasonable bounty. Apparently not. Bobbins has just stated that he feels it's reasonable to get emotionally upset when people interfere with his Eve gameplay. What an interesting insight, it certainly explains a lot. Thanks for sharing Bobbins, much appreciated. Bobbins is having trouble remembering that EvE Online is a PvP spaceship game. PvP means that other players are able to use in-game pixel violence to interfere with your game play. I suggest Bobbins consider this game if PvP disturbs him. You very welcome however as it stands at the moment the New Order isn't really anything to get 'emotional' about. Particularly this rather sad attempt to place a rather pathetic bounty on people. There are many Pvpers who do not consider suicide ganking in highsec Pvp. How can suicide ganking afkers and bots be pvp anyway? Agent Trask versus an empty chair, I glad you find it challenging. If Ganking is not PvP, then exactly who is getting ganked? A player, called the ganker, is acting against another player, called the miner. This IS a player versus player action, like it or not, Bobbins. Your argument is an example of the "no true Scotsman" fallacy. As for challenge ... the challenge here is attempting to control highsec. A worthy challenge indeed. Many miners will need to be ganked to accomplish this. Anyone else feel that the bounty system is still broken? At the time of the back and forth mailing, his bounty was around 800k-1m. Watch out guys, he's a very dangerous person! Watch out for this terrifying space warrior. James315 combat record is even worse but I suppose he is very busy imagining to run highsec and all that. You are welcome to attempt to violence it, Bobbins. James315 doesn't pvp does he I believe he is current playing this game as recommended by the New Order to non pvping wimps. "as recommended by the New Order to non pvping wimps." Of course. See above, Agent Trask recommended the game for me and my good buddy James315 although I'm not as risk adverse as James315. The challenge still stands, Bobbins. "I am rubber, you are glue" 'arguments' will not alter your failure to engage James315's Invincible Stabber in combat. Oh, and thanks for showing us that my characterization of your carebearness bothered you. Tears are always appreciated. It is you who seems 'bothered' but your welcome all the same. Funny how he claimed it was okay to continue with the bounty, then when it happens he cries? Did he not expect another bounty after the previous bounties and saying it was okay to receive another bounty? I suppose a bounty makes all kinds of targeted violence legal, as it has a purpose. confirming critical case of butthurt,placed 100k (lol) bounty on him,got ragemails. thank you james. Why are all these carebears upset over a bounty? Erotica 1 has a huge bounty and she undocks just fine. Hell, she even encourages clients to "tip" her with the bounty. Because carebers still want to believe that bounties are meaningful. They get butthurt when we place bounties on them as a joke, and in order to make the "bounty" overview flag useless as a warning system. Bobbins it's trolls one isn't supposed to feed, feeding idiots, babies, and kittens is just basic human decency. Perhaps that's more than you aspire to. Anon12:11 asked a good question, which I answered. Your request, that I not answer questions by other players, is denied.